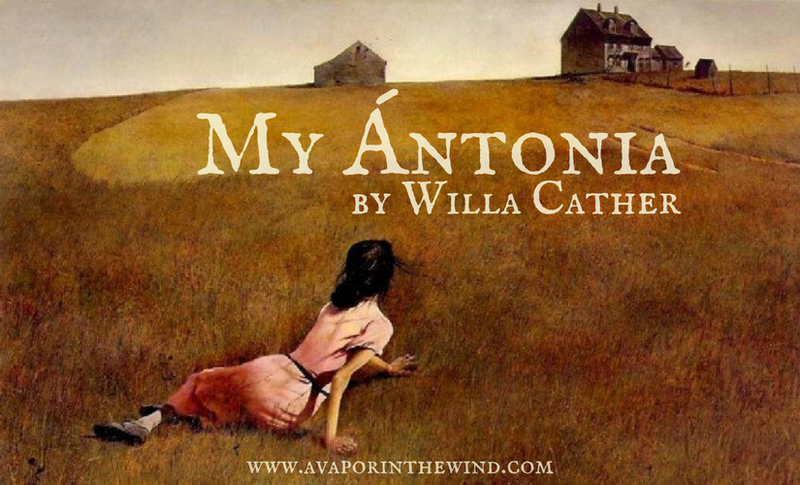 Few books keep me up past midnight, draw me completely in, and tug on every single one of my heartstrings but My Ántonia by Willa Cather was one of those books. Something about the nostalgic first-person reminiscing of young Jim Burden resonated with me. His memoir focuses on his childhood, the golden days of his life, with the central focus being Ántonia Shimerda, his Bohemian neighbor who emigrated from the Czech Republic to the North Dakota frontier with her family around the same time the ten-year-old Jim, newly orphaned, moved from his parents’ home in Virginia to live on his grandparents’ farm on the prairie. Jim and Ántonia share various adventures and struggles together with their friends and family on the North Dakota plains and the memories they make together are grafted into Jim's mind as the best days of his life. What struck me about this book is the lack of climax in the storyline. Jim’s memories are meandering and selective at best, always coming back to his Ántonia. However, there is an inherent ambiguity to Jim and Tony’s relationship and it is this lack of resolve that kept me turning the page. I kept waiting for that moment of resolution but it never came and that was perhaps the most satisfying, heartrending, realistic aspect of this novel. The title of the book is My Ántonia but in what way is Ántonia Jim’s? You never really know. It is never explicitly defined by the narrator. Cather gives the impression that Jim and Ántonia care for each other very much and toward the end of the novel Jim confesses to Ántonia’s children that he was once in love with their mother, but you never really hear from Ántonia what Jim means to her, though it is evident she cares for him very much. One of the most interesting speeches is shared upon Jim's return home when he hears of Tony's misfortune. Ántonia is living once again on her family’s farm, laboring in the fields and living in relative solitude and shame with the child she had out of wedlock after her supposed fiancée abandons her. Jim is disappointed in her and sad for her, but he still cares for her very much even though he is resigned to their prospective destinies that seem to constantly lead them down different paths...though always back to each other again. There are multiple opportunities for Jim and Ántonia’s relationship to slip into the romantic realm and while the reader anticipates this, Cather bypasses each one of these opportunities and keeps their friendship platonic. While this leaves a certain amount of ambiguity to their relationship, it seemed to me that to suddenly romanticize their friendship would lessen it somehow. Ántonia was never simply Jim’s sweetheart but she was also never simply his friend. She was so much more than that. One of the frustrating aspects of this book, at least frustrating to me, was the passiveness of Jim’s character. He obviously loves Ántonia. She influences his thoughts and opinions every day. The memory of her is his most cherished memory and he never encounters anyone else in his lifetime who could ever replace her. And yet Jim never acts on his feelings. He never asserts himself and pursues Tony. The reverse of gender roles is one of the defining characteristics of Cather’s novel. Ántonia is obviously the assertive one, assuming the manual labor of her father’s farm, boasting about her strength, maintaining her pride and independence, refusing to take orders from anyone, and ultimately carving her own path in life. Jim is the passive, almost submissive one but he is perhaps the more sensitive, empathetic, and introspective character as well. Ántonia’s fortunes eventually change for the better, no doubt as a result of her persevering spirit and determination. But it was still difficult for me to read about her misfortunes and Jim’s disappointment without a slight disappointment in Jim. After all, might he not have prevented some of her misfortunes if he had simply come out and expressed his feelings for her and married her? And yet Ántonia never resents him for this. She never expects anyone, including Jim, to assume any responsibility for her. As with everyone she loves, she can never presume anything false or bad about Jim, even when he avoids visiting her for twenty-some years out of fear for seeing her aged. Just as Jim remembers her, Ántonia always remembers him to her many children with the utmost fondness and later welcomes him into her home as somewhat of a surrogate uncle in the family. Their relationship is never clearly defined, but this is perhaps what preserves it through the years. I love this book too! Though I saw Jim's passivity as a conscience choosing of his worldly/city prospects over Antonia. She probably wouldn't have been happy in the city and even if she had followed him an early marriage to someone without wealth and connections would have possibly derailed his career. The description of his wife in the first chapter shows what he ultimately choose (a woman who furthered his career but never really loved him) and I believe that he knew what he was choosing. That is an excellent point! Jim's love for Antonia is kind of tied in with his love for the North Dakota country. The two could never really be separated.